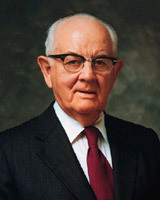 President Spencer W. Kimball (1895-1985) was ordained an apostle in 1943 and served as President of the Church from 1973 to 1985. “We hope that the leaders and the members of the Church who have attended and listened to the conference have been inspired and uplifted. We hope you have made copious notes of the thoughts that have come to your mind as the Brethren have addressed you. Many suggestions have been given that will help you as leaders in the perfection of your work. Many helpful thoughts have been given for the perfection of our own lives, and that, of course, is the basic reason for our coming. "Well, now, brothers and sisters, this is the gospel of Jesus Christ, and to all who are listening in, we have not been fooling. 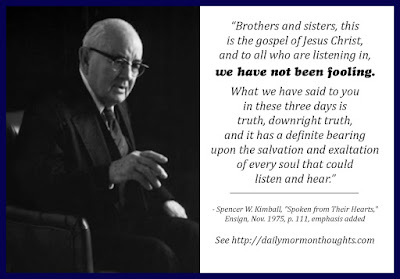 What we have said to you in these three days is truth, downright truth, and it has a definite bearing upon the salvation and exaltation of every soul that could listen and hear. 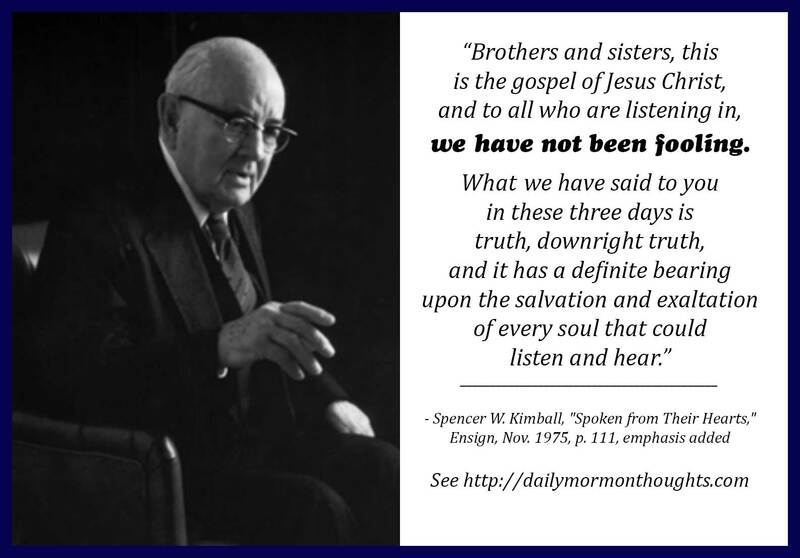 I loved reviewing these thoughts President Kimball shared as he reflected on the messages of a general conference weekend. The talk must have been spontaneous; he reviews and comments on talks given by other speakers throughout the conference. It's interesting that he encouraged the taking of "copious notes," not of the things the speakers said, but "of the thoughts that have come to your mind as the Brethren have addressed you." He himself made the following observation about his own desire to act on conference impressions; how interesting, coming from the president of the Church! 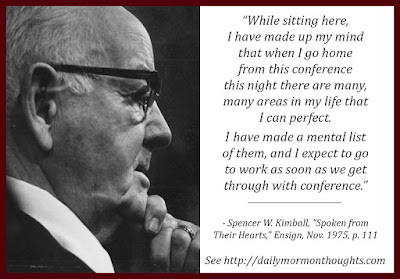 After having summarized the messages given throughout the conference, President Kimball shared this personal witness. I doubt anyone would accuse the Church leaders of "fooling" in their messages, but perhaps we act as if they were by our casual response to their instructions. The key is that the gospel of Jesus Christ is available in fullness to all who listen. But we must listen and heed the counsel. "We hope they will not make the mistake of casting it aside or ignoring it." 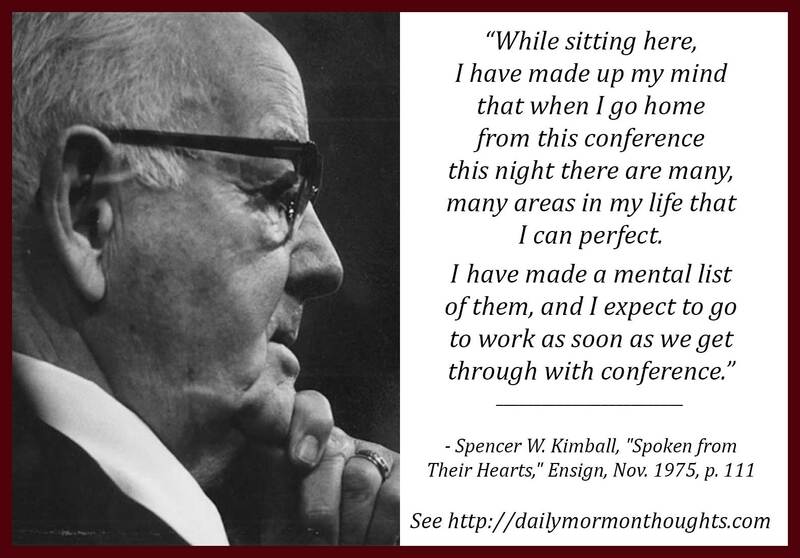 I love President Kimball's simple, humble sincerity.